Almost two years after the firestorm that took place in Ferguson, Missouri, when a white police officer shot an unarmed black teenager and militarized police descended in a brutal show of force to quell local protests, not much has really changed for the better. Unarmed Americans are still getting shot by police with alarming regularity. SWAT teams are still bursting through doors, terrorizing families and leaving lives and property shattered. In one incident, a Kansas SWAT team erroneously raided the home of two former CIA analysts after police observed family members shopping at a gardening store and found loose-leaf tea (mistaken for marijuana) in the family’s trash can. And the military industrial complex is still making a killing (literally and figuratively) at taxpayer expense from the transformation of small-town police forces—“kitted out with Marine-issue camouflage and military-grade body armor, toting short-barreled assault rifles, and rolling around in armored vehicles”—into extensions of the military. What has changed is the extent to which Americans—easily distracted by all of the political mumbo jumbo being bantered around—seem to have stopped paying attention or being outraged about revelations of government corruption, wrongdoing and outright abuse. And yet another part of this indifference seemingly stems from the fact that we just don’t value human life as much as we should. How many Americans seem unconcerned about the carnage inflicted on civilians worldwide as a result of the nation’s bloody, endless wars abroad? As The Washington Post makes clear, the end result of ignoring these civilian casualties and burying memories of war’s destruction is more wars, more blowback, and more innocent blood on our hands. If there’s one area where Americans do seem to still get outraged, it’s in relation to their pets, who occupy a sizeable place in their hearts, homes and wallets. The so-called “dangerous” breeds of dogs aren’t the only ones that are being killed in encounters with police either. Essentially, police can shoot your dog for any reason or no reason at all. What’s more, the general consensus from the courts thus far has been to absolve police from charges of wrongdoing. Conversely, while police routinely receive little blowback for shooting family pets, shooting a police dog can land you in just as much trouble as if you shoot a human being: for instance, a teenager who shot and killed a police dog received a23-year prison sentence. Not to worry. I’m just getting warmed up. Mind you, these are not isolated instances. 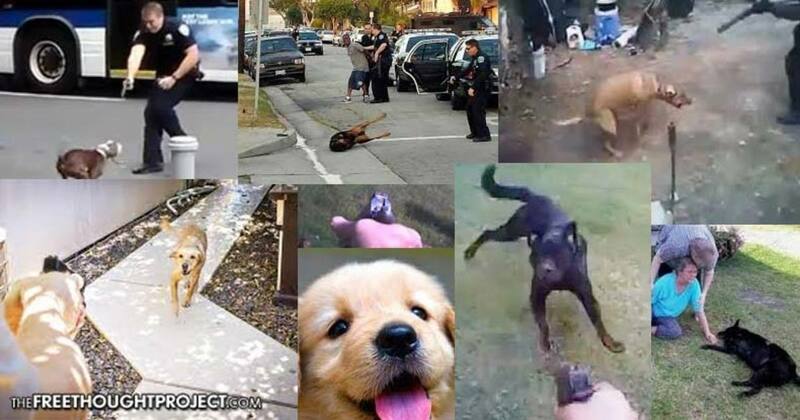 There are websites, community action organizations and Facebook groups that do nothing but publicize dog shootings by police, and there are a lot of them. One filmmaker, Andrea B. Scott, has even put together a documentary to raise awareness about the epidemic. Clearly, our four-legged friends are suffering at the hands of a police state in which the police have all the rights and the citizenry (and their “civilian” dogs) have little to none. As always, we have to dig down deep to understand why is this happening. Are family dogs really such a menace to police? Are law enforcement agents really so fearful for their safety—and so badly trained—that they have no recourse when they encounter a dog than to shoot? Finally, are police shootings of dogs really any different than police shootings of unarmed citizens? Second, these dog shootings epitomize a larger, societal problem with law enforcement agencies prioritizing an “officer safety” mindset that encourages police to shoot first and ask questions later. We’d have a lot fewer police shootings (of dogs and unarmed citizens) if police weren’t quite so preoccupied with “officer safety” at the expense of all else. Third, these dog killings are, as Balko recognizes, “a side effect of the new SWAT, paramilitary focus in many police departments, which has supplanted the idea of being an ‘officer of the peace.’” Thus, whether you’re talking about police shooting dogs or citizens, the mindset is the same: a rush to violence, abuse of power, fear for officer safety, poor training in how to de-escalate a situation, and general carelessness. That paramilitary focus has resulted in a government mindset that allows SWAT teams and other government agents to invade your home, break down your doors, kill your dog (the dog always gets shot first), wound or kill you, damage your furnishings and terrorize your family. This is the same mindset that sees nothing wrong with American citizens being subjected to roadside strip searches, forcible blood draws, invasive surveillance, questionable exposure to radiation and secret government experiments, and other morally reprehensible tactics. Frankly, police should also be made to undergo classes annually on how to peacefully resolve and de-escalate situations with the citizenry. While they’re at it, they should be forced to de-militarize. No one outside the battlefield—and barring a foreign invasion, the U.S. should never be considered a domestic battlefield—should be equipped with the kinds of weapons and gear being worn and used by local police forces today. If the politicians are serious about instituting far-reaching gun control measures, let them start by taking the guns and SWAT teams away from the countless civilian agencies that have nothing to do with military defense that are packing lethal heat. Finally, there will be no end to the bloodshed—of unarmed Americans or their family pets—until police stop viewing themselves as superior to those whom they are supposed to serve and start acting like the peace officers they’re supposed to be. Ultimately, this comes down to better—and constant—training in nonviolent tactics, serious consequences for those who engage in excessive force, and a seismic shift in how the law enforcement agencies and the courts deal with those who transgress. As I point out in my book Battlefield America: The War on the American People, when you’re trained to kill anything that poses the slightest threat (imagined or real), when you’ve been instructed to view yourself as a soldier and those you’re supposed to serve as enemy combatants on a battlefield, when you can kill and there are no legal consequences for your actions, and when you are deemed immune from lawsuits holding you accountable for the use of excessive force, then it won’t matter what gets in your way. Whether it’s a family pet, a child with a toy gun, or an old man with a cane—you’re going to shoot to kill.